We’ve developed a book to pay tribute to the women who are part of the story of 100 Years of Women in Policing in Tasmania. The images and stories tell the history of women in Tasmania Police through their recollections, anecdotes and historical records. A few of these stories include the first woman police officer, the first woman promoted, the first woman allowed to marry and remain a police officer, and the first woman appointed to a specialist role. Of course there are many more firsts and many more women who have contributed to the Tasmania Police of today who are not mentioned in this book. No doubt there are many more stories out there. Let this book be an acknowledgement of the achievements of all the women who have served as police officers and in state service roles, and the contribution they have made in shaping the Tasmania Police of today. Thank you to all the women of Tasmania Police 1917–2017. 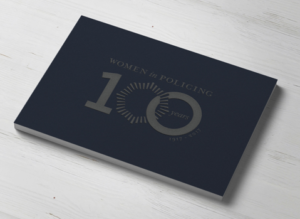 To order a copy of the 100 Years of Women in Policing book, click here. This page -- https://www.police.tas.gov.au/about-us/100-years-women-policing-tasmania-police/100-years-women-policing-book/ -- was last published on December 14, 2017 by the Department of Police, Fire and Emergency Management.